The seca 703 is equipped with two options: integrate a mechanical measuring rod or receive data wirelessly from a separate digital stadiometer. Other advantages include a high load bearing capacity of up to 660 lbs, slip resistant cast iron base and anti-tip column design. With everything primed for the future and integration in any EMR system, measurements can be transmitted via the seca 360� wireless system. Weighing small children to obese patients. The seca 703 can do it all. Especially when it comes to finding out BMI and height. Then there are two options: integrate a mechanical measuring rod (the measuring rod seca 220 will be delivered with the scale) or receive data wirelessly from a separate digital stadiometer. Other heavyweight advantages include the scale's capacity of up to 550 lbs, the large and flat platform and the time-saving functions Pre-TARE, HOLD, auto-HOLD and mother/child. With everything primed for the future and integration in EMR using the seca 360� wireless. seca added value: A column scale that can receive height measurements and then calculate the BMI. There is such a thing from seca, of course. 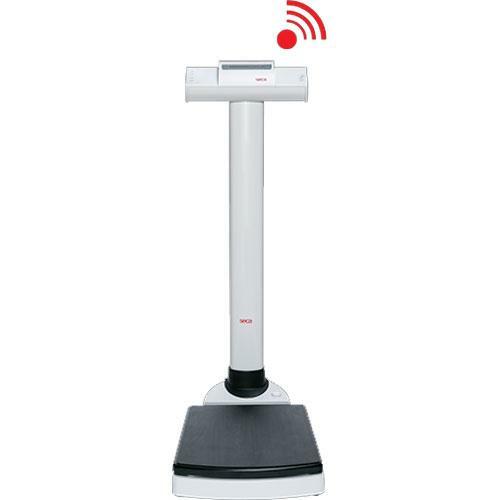 With the help of the new seca 360� wireless technology, the seca 703 can receive data from a separate stadiometer and then automatically calculate the BMI from height and weight. Do you want to send the results wirelessly to your PC or to a seca wireless printer. It's as easy as pressing the function key. The base is of heavy cast iron, capable of withstanding heavy loads. Practical castors permit mobile use. Extremely robust, precise and stable: With a capacity of 550 lbs, a large but low platform and the integrated, BMI function, this column scale has the functionality for the diagnosis and therapy of heavy or obese patients. The heavy-duty and durable cast iron construction copes with the most extreme loads. And the energy-saving battery operation – up to 16,000 weighings with just one set of batteries – means that this scale can be used anywhere as it is not dependent on AC power.